I had some extra apples left over, so I thought I'd make good use of them, and use my ramekins to make individual apple crisps. 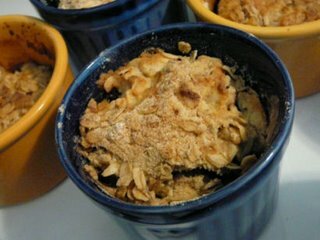 Feel free to substitute berries for apples, and instead of a crisp top, you can make it more 'cake-y' by adding some milk and baking soda. 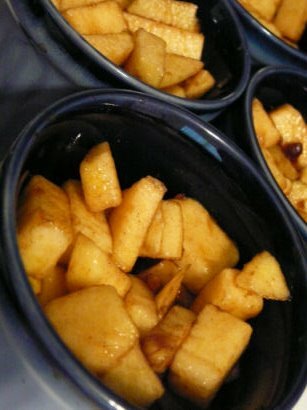 Peel, core, and dice apples into baking pan/ramekins. Add lemon juice to keep them from oxidizing. Add allspice, brown sugar, mix to taste. Also add a dash of rum, vanilla. Mix well, and set aside. For the crumb topping, mix flour, sugar, and oats. Add small pieces of butter, mash together, until the product looks crumbly. Add to top of apple mixture. Bake at 375 degrees F for 30-45 min. Serve warm with ice cream, or cooled with coffee. I made my ice cream previously. Note: If you want to omit the crumbly topping and instead get a more cake-like top, simply remove the oats, increase flour content slightly, add milk and baking soda to achieve a smooth batter like texture.